this piv is pretty good… when the South African locals saw our three Wong’s in the back of the van… it caused quite a stir… a damn crowed gathered round to look at our hybrids. – the beach launches were really something else. 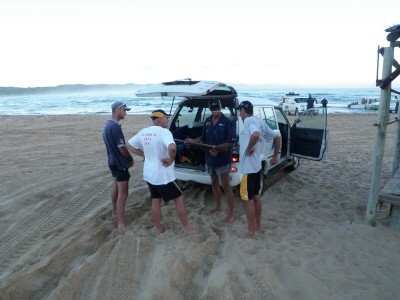 I’m a Reconnaissance Marine… and I thought I’d seen it all regarding beach launches… but they take it to another level. We got our 22’ boat completely out of the water several times. As far as game – they have it all – right there close to shore. The reefs at Sodwana are between 60’ and 100’ deep and hold cudas, grouper, etc. But very near the shore there are deep cuts where the bottom falls away to about 800’ deep. There they get everything from whaoo to “sailies” to marlin. They also have a ton of sharks… which is a tribute to the health of the ecosystem. In fact the first thing I saw when I jumped in at the “cut” as it’s called was two white lines swaying back and forth beneath me… and I just couldn’t make out what it was. It was very large Zambezi’s remoras! My guide told me a harrowing story of a personal encounter with a positively enormous oceanic white tip… just after we were done chumming and hunting at the spot where it happened. But no white sharks that far north. Planning on doing some rig hunts… I’ll let you know how it goes. Most of the clubs here are scuba divers… so they look at me like I’m a freak when I show up to the boat with “just” my gun. To each his own. I’ve got to be honest Daryl – I’d probably sell you my first born for a crack at a whaoo. Attached is a picture of Zac… what do you think… Zac for a whaoo? I’ll even throw in a box of diapers. p.s. My buddy Matt and I are planning on doing a Performance Free diving clinic.... after that course I’ll be on the first flight to Hawaii for wahoo. 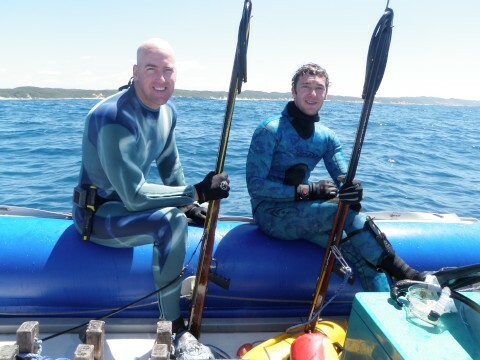 Oh well, even bad day spearfishing is a damn good time.